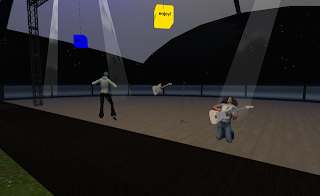 The Seasonal Party on Virtually Live this past Saturday was a wonderful experience. Everyone's photos, posts, and ims have been heartfelt and warm. Thank you! About a month ago, I blogged the tree. I had tried hard to build something bushy, beautiful, and fitting for the island. 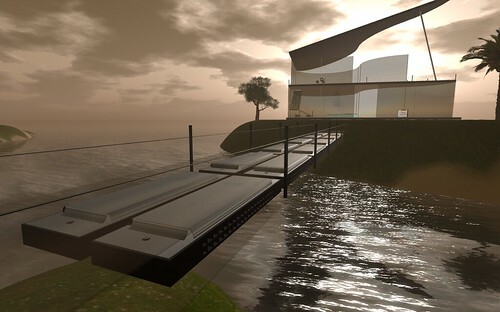 The final shocking prim count seemed a noteworthy convenience of building in Openlife. Of course, the tree was also a quiet announcement of the party to come. However, over the following weeks, it raised many technical and social questions in my mind. To summarize: "Would the tree still be bare on 20 December?" From a technical standpoint, grid performance was solid. The party lasted almost four hours without a region crash. The peak number of avs by my map count was 31, although others reported higher. 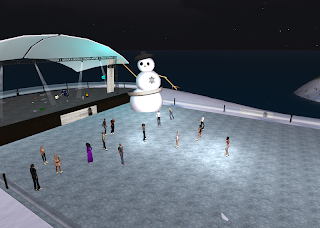 For over two hours, 25+ avs danced, skated, decorated or otherwise enjoyed themselves in an open build and scripting environment. Socially, it was an undeniable delight. 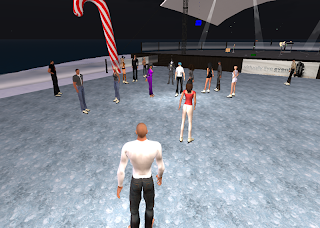 DJ Gert Grigges had everyone moving for hours; Cat Agus Cu (Mistletoe Ethaniel and Doc Foster) provided an interlude of live music; and Father Christmas patiently listened to all the wishes of naughty and nice avs on the grid. In total, approximately 45 avs stopped by the party. 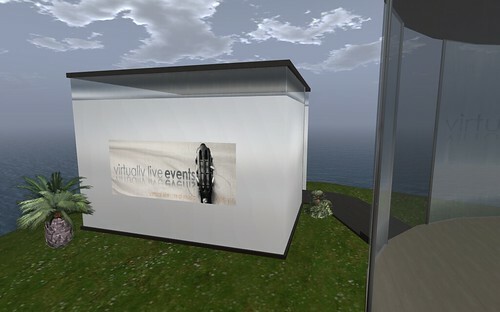 Many friends also mentioned that they had friends online unable to attend in pixels but were there in spirit. I remember camming around at one point, wondering about the tree. What I saw was a magical sight with avs darting in and out decorating. In that single moment, all the "bare tree" questions were resolved. Please continue to visit and decorate through 25 December. Every prim contributes to Médecins Sans Frontières. P.S. Please click the photos to view full-sized images. 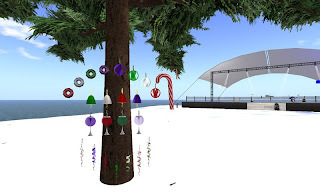 Virtually Live Events will be hosting a seasonal party to decorate the big tree on the ice this coming Saturday, 19 December 2009, at 9PM UTC on Virtually Live. Decorating will support Médecins Sans Frontières (Doctors without Borders). Please read below for details. 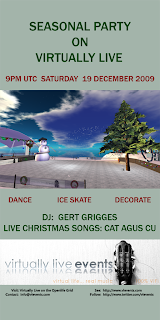 Music will be provided by DJ Gert Grigges with an interlude of Christmas songs performed live by Cat Agus Cu [avs Mistletoe Ethaniel and Doc Foster], so come, dance, ice skate, and decorate! The tree will be parcelled for building and each visitor is welcome to use the ornaments provided along the ice rink wall near the tree or to build one's own. The ornaments along the wall are copyable so just take to inventory, rez a copy, and place on the tree. There are some rules for building one's own decorations but they are simple and for a good cause. 1. 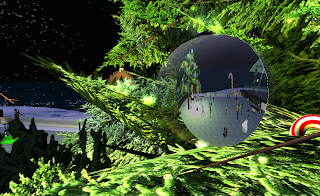 Each av can build as many ornaments as desired within a 256 prim allowance. 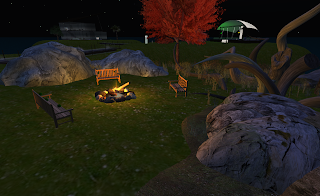 The tree parcel initially will be set to 10000 prims. For each 1000 prims on the parcel, Virtually Live Events will contribute US$10 to Médecins Sans Frontières (Doctors without Borders). 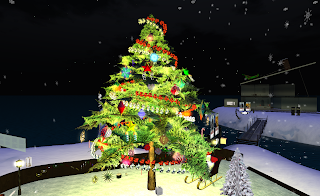 If the parcel limit of 10000 prims is met any time before the end of Christmas Day, the limit will be raised an additional 10000 prims. So please come and encourage others to participate to maximize the value of this contribution. Now, who's been naughty and nice this year? Its the holiday season, so everyone needs ice skates. 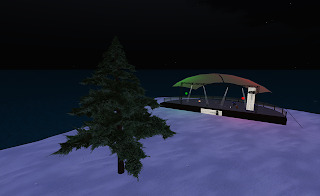 Find the FREE ice skates under the Christmas tree on Virtually Live island in OpenLife. 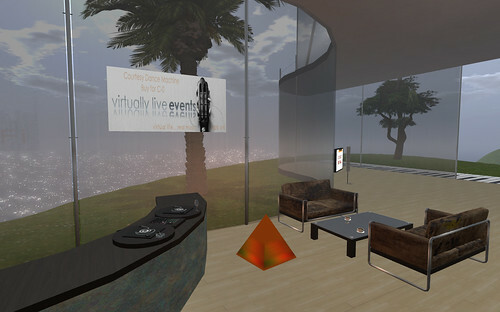 Digital (Digi) Dreambuilder's Danaus Foundation is hosting a competition in the form of a treasure hunt on the Openlife Grid with an environmental theme, spanning the 12 days of the UN Climate Change Conference taking place in Copenhagen between December 7th and 18th, 2009. What was supposed to be an initial test of Adec's fine ice skates, turned into a full-fledged region stress test literally and figurat ively. There were between 15 - 20 avs skating for the better part of an hour and there are some seriously sharp elbows on the grid! Adec is tweaking the final version of the skates with a helpful pitch-in by Dawn Harbour of London Core who, among other things, noted immediately that the Yeti-sizing was too limited for women's tastes. :) The skates will be under the tree soon. 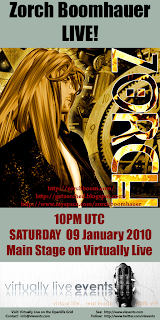 Please mark your calendars for 9:00PM UTC, Saturday, 19 December 2009. A stout 3225 prim Fraser Fir has arrived on Virtually Live island, ready for decorating. The question is: "How?!" 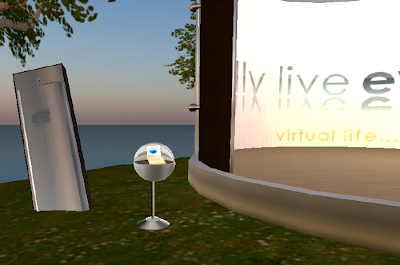 A new permanent feature at Virtually Live island has just opened! 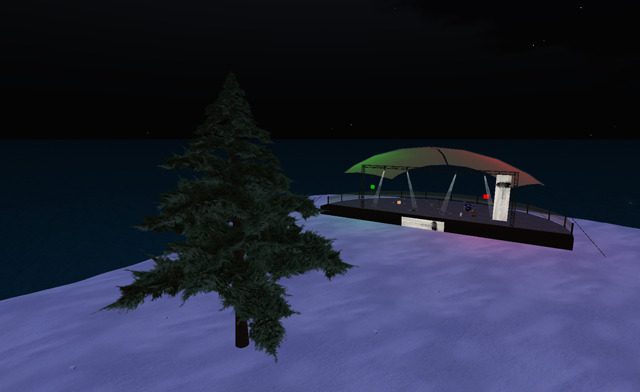 Come and get all slushy down at The Pier.. We've parcelled off this couples dance area to always play a relaxing, romantic stream, and placed 3 couples dances / poses for you to play with. 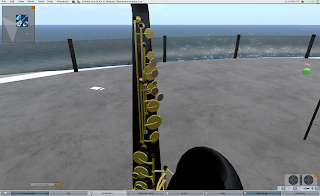 To get to the dance area, walk down the neck of the guitar from the main island, and enjoy. But I love you until the end of time.. 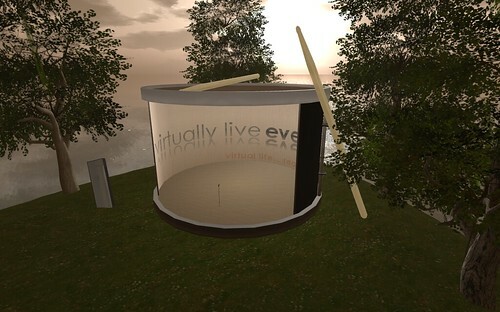 I will love you until my dying day.."
Ever since travelling the metaverse with Debbie Trilling, the first conversation in any new world is always the same..
Adec - "We need a club.."
Debbie - "I'll make a Dance Machine." 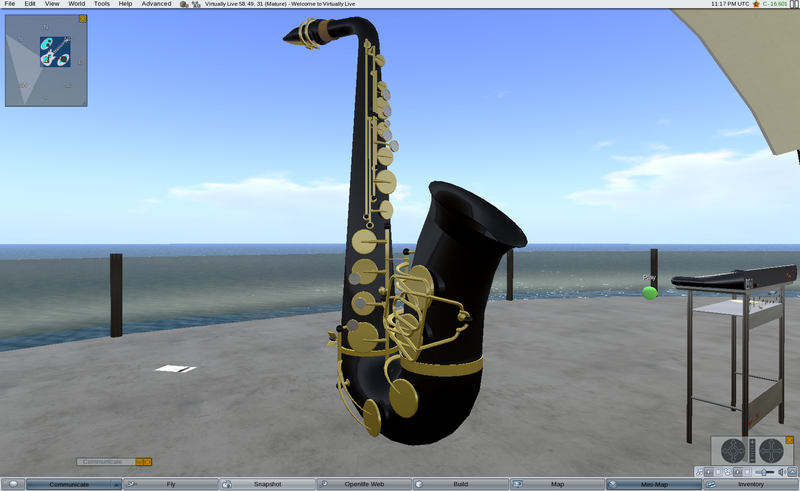 ..and the same happened in OpenLife. 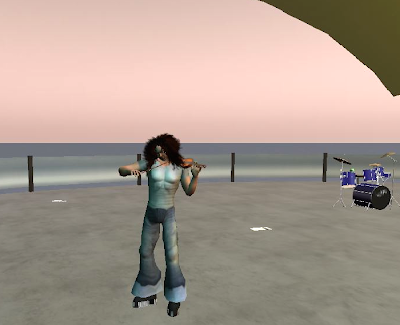 Scripted specifically for the OpenLife script engine, Debbie created probably the first real Dance Machine here, and has been improving it ever since. 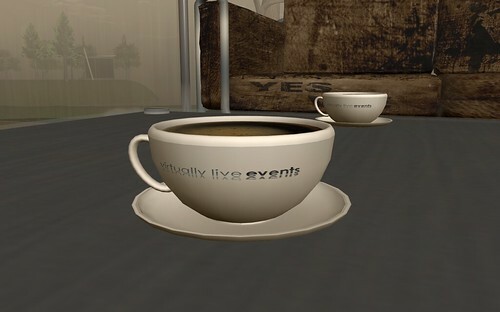 So here at Virtually Live we're giving it away for free! 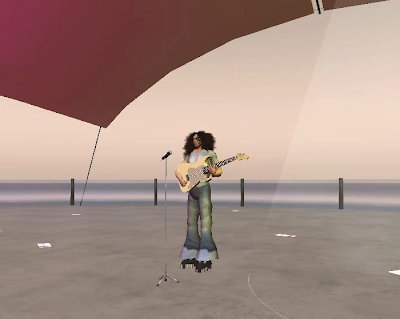 Head over to the club hangout and grab your free Virtually Live Courtesy Dance Machine! 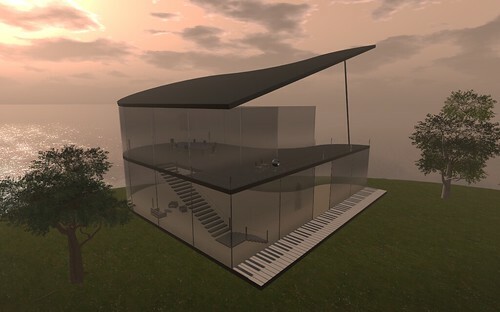 So basically, this is adjacent to the hangout, and is a place that you can freely rez and open all those boxes that you have bought across the OpenLife grid. 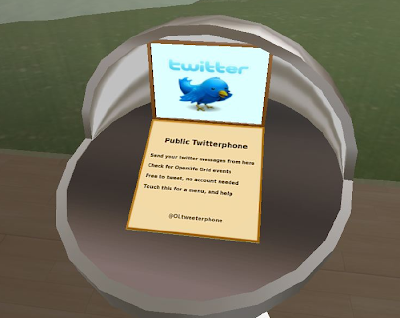 Unpack your clothes etc and get changed... just beware there is a 15 min auto return set here, apart from that, please enjoy and use the new addition to the hangout! 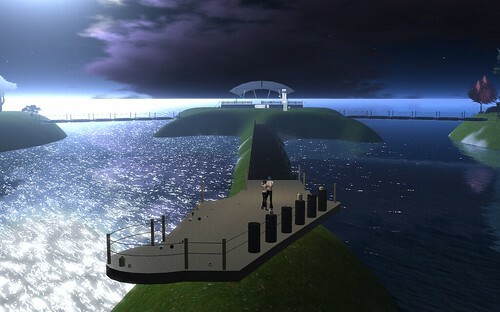 Quick build update from Virtually Live island in Openlife. 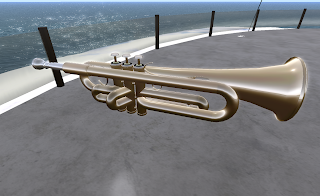 New Harmonica Bridges span the gap between the main stage and the 2 adjacent islands - no more need to get your feet wet! 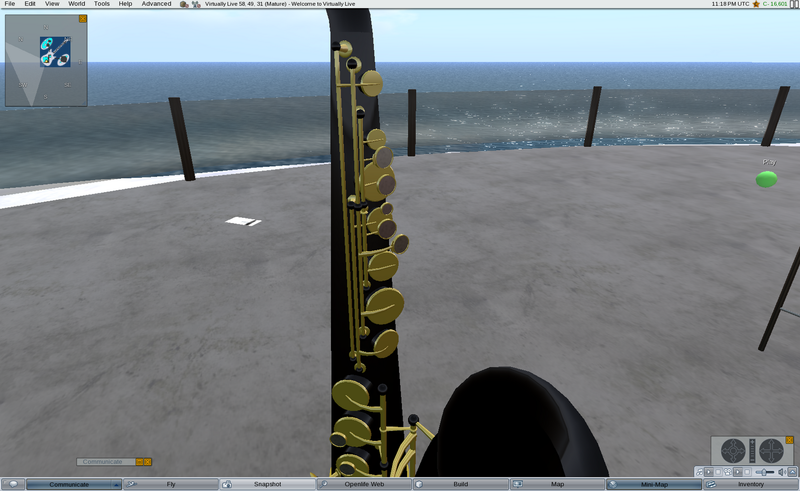 900 odd prim bridges are difficult to move, which is why it was so much nicer creating the new Secondary Stage. 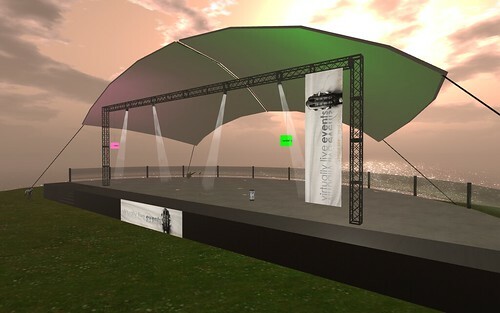 A smaller venue than the Main Stage, but just as important for those intimate gigs! 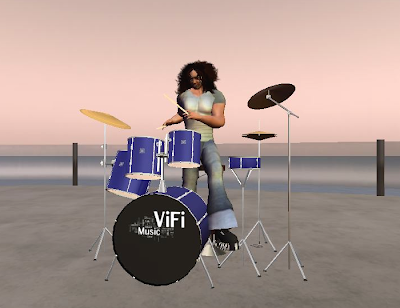 And following on the musical theme of the island, yes its a drum! 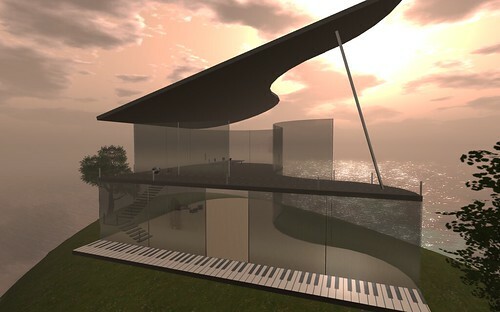 Come on over to see the build, and don't forget to visit the new club hangout! see you there.. 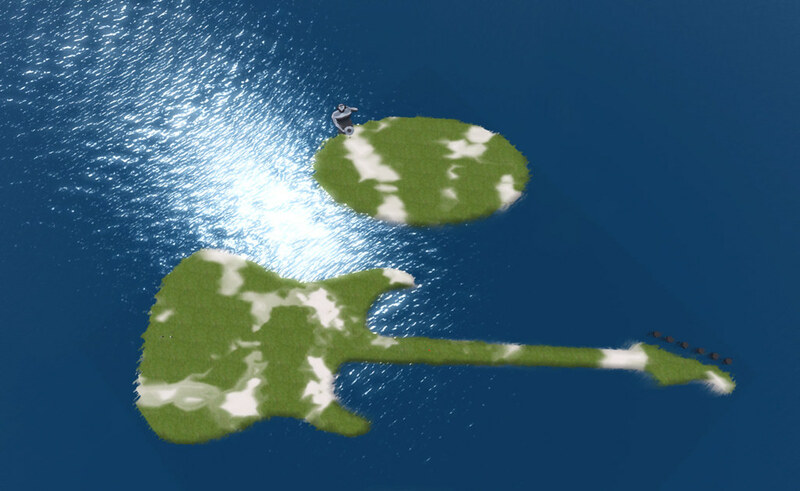 Virtually Live Island.. it just keeps gettin' better! 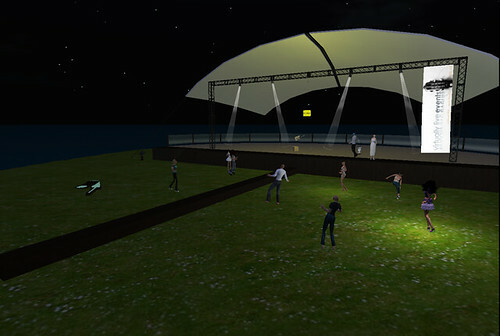 As Surreal pointed out, last night we got flash mobbed, so the design of the main stage was made public earlier than anticipated .. so for those that couldn't make the party.. here's the new main stage at Virtually Live Island in OpenLife..
..it also meant we had to have a bit of a speed build day today to get the new hangout built on the opposite island, so I can finlly say HANGOUT OPEN! 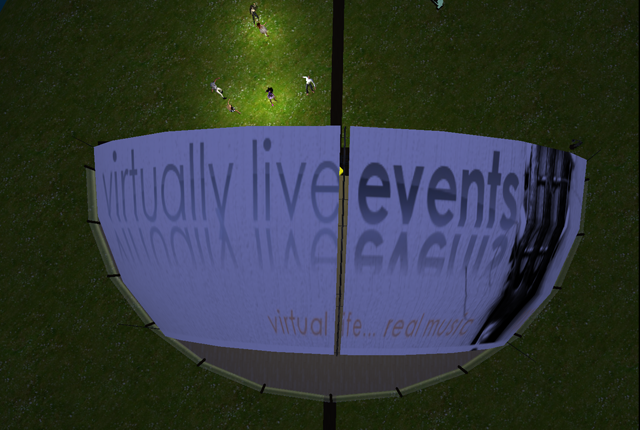 Welcome to the website of Virtually Live Events, the Openlifegrid-initiated project dedicated to bringing real music to your virtual life. 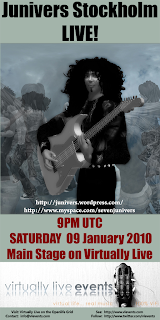 Within these pages, please enjoy the project updates, event announcements and reviews as well as general coverage of music in virtual worlds and specific musician profiles.